More than 70 attendees enjoyed guided tours to inspect and watch the spreads at work and have the opportunity for questions and answers with McCloskey experts. More than 70 attendees enjoyed guided tours to inspect and watch the spreads at work and have the opportunity for questions and answers with McCloskey experts. The event also featured factory tours of the Granville and Killyman facilities, and a Dealer Forum at Clonoe over the two-day event. For the demonstrations, the equipment was arranged in productive combinations of crushing, screening and stacking, with one dedicated to showcase the newest compact crushers on the market. Material varied over the three spreads, showing the superior end product delivered in two key applications including demolition material and crushing blasted rock. McCloskey crushers feed a 100’ stacker to mount the quarry face to the S190 Triple Deck. The first demonstration featured a J44 jaw crusher, C38 cone crusher, 100' stacker and an S190 Triple Deck screener. The jaw was fed 600 x 600 mm blasted rock producing output sizes at 3-4 inch minus. This was fed into the cone which, due to its high crushing ratio, output high quality material at 24mm minus. The material was then fed to McCloskey's iconic S190 Triple Deck screener to deliver four products ranging from 22mm+ oversize to 12mm minus fines. The power of the jaw and cone crushers working in tandem, along with the S190 and a 100' stacker feeding material from the base of the quarry face to the S190 above allowed dealers to observe the process from beginning to end for aggregate customers. High production J45 feeds the R155 reclaimer. The second demonstration area featured the J45 jaw crusher feeding crushed aggregate into the rugged and productive R155 reclaimer. The J45 material was fed in at 500 mm minus and output 4-5 inch minus to the screener, which then stockpiled three products ranging from 80mm+ to 30 mm minus fines. The powerful new compact crushers, the I34R recirculating impact crusher, and the J35 jaw crusher, were showcased in the third demonstration area at King Bros. Quarry. The new crushers are able to nimbly move around tight spaces while crushing, are easily transported site to site, and are uniquely suited to a number of applications including aggregates, construction & demolition and recycling. Kirwan Barr, director of Australian dealer MSC Group noted, "We thoroughly enjoyed the event. The quarry demo was a perfect showcase of McCloskey equipment in action, particularly the performance of the new compact crushers. The factory tours highlighted the attention to detail and superior workmanship we have come to expect from McCloskey, and the presentations during the Dealer Forum were very informative and educational." "We are deeply appreciative for the opportunity King Bros. gave us to demonstrate our equipment at their quarry. The perfect weather, combined with this perfect venue, made the event are sounding success on every level. 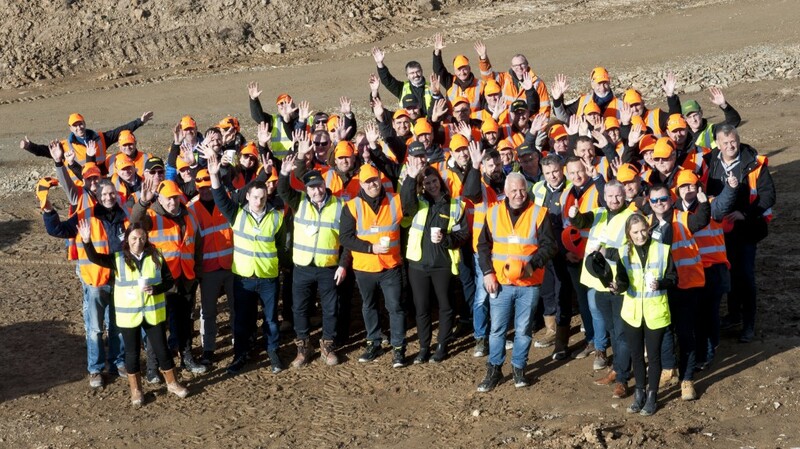 We extend our sincere thanks to them, as well as to all those who joined us, we were delighted with the turnout," said Steve Walls, McCloskey international sales director. "The demonstrations, coupled with the Dealer Forum, have set a new model for us to assist dealers in developing and delivering high productivity solutions for customers." Over 27 McCloskey Dealerships attended the event representing 21 countries where McCloskey equipment is sold.